Resources and case stories to support the use of public engagement strategies to address difficult issues and situations. Local officials often find that only a relatively small number of community members actually take part in public conversations and forums. A failure to involve a cross-section of residents limits the effectiveness of these public engagement efforts and negatively impacts the breadth and quality of ideas contributed. It can also reduce community support for the final decisions. 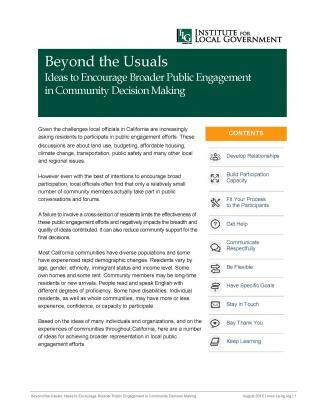 This publication provides ten essential strategies to extend participation and increase the views and voices in a community’s public engagement activities. 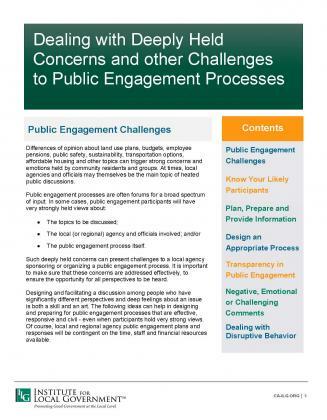 This tip sheet offers ideas for the planning and delivery of public engagement activities when participants’ deeply held views and values make successful outcomes more of a challenge. Public engagement processes are often forums for very deeply held concerns. In some cases, public engagement participants will have very strongly held views about the topics to be discussed; the local (or regional) agency and officials involved; and/or the public engagement process itself. This resource provides tips for overcoming these challenges. This article provides strategies that leaders can employ to maximize the likelihood that public meetings on controversial issues will involve constructive exchanges that contribute to the best decision being made. This article analyzes the ethical issues associated with grandstanding and offers tips for dealing with grandstanders. A packed room of city managers and county administrators listens to speakers at an Institute-organized session on “Dealing with Deeply Held Concerns When Values and Beliefs Collide” at a recent conference.